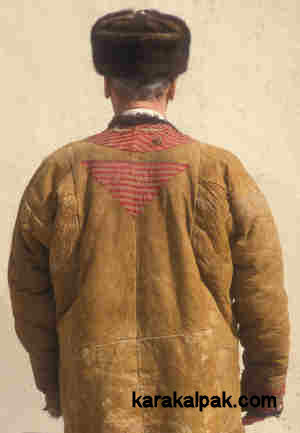 The Karakalpak man’s postın is a heavy and bulky sheepskin overcoat, worn with the skin facing outwards and the fleece facing inwards. The outer sheepskin facing of the coat is dyed a light yellow colour and the outer edges – consisting of the collar and front panels and the coat bottom and the cuffs - are decorated with narrow strips of black or brown astrakhan pelt. These strips are bordered on the outside face of the coat with a band of striped, usually red, cloth which is often made of silk. A large triangular amulet, made from the same striped cloth and known as a jawırınsha decorates the back of the coat, just below the collar. The long woollen fleece is often exposed along the front and bottom edges of the coat and around the collar and cuffs. Obviously the inner fleece means that the coat requires no lining. 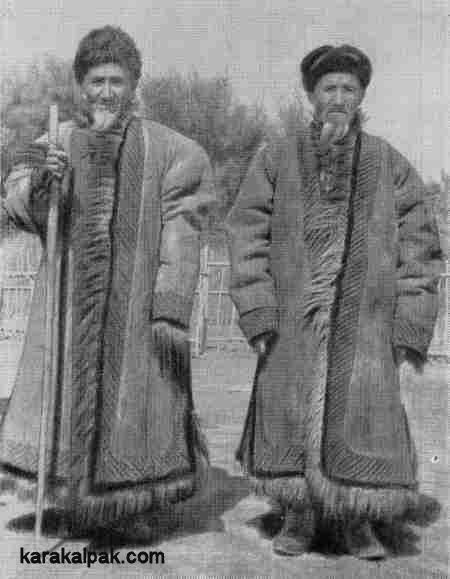 Two old Karakalpaks wearing postıns. Photographed by members of the the Khorezm Expedition in the early 1970s. From "Ethnography of the Karakalpak", 1980. Postın coats were made in a range of quality levels. The most simple were made from an ordinary sheepskin pelt and these were often called ton by the local people. In Karakalpak a sheep's pelt is called a qoy terisi. Better quality coats were made from the pelts of lambs (qozı), often of the Arabi variety. These were known as sen'sen' ton, the Karakalpak word for lambskin being sen'sen'. However the finest postıns were made wholly of astrakhan, a very fine quality of lambskin derived from young karakul lambs, the wool of which tends to be black, brown, or dark grey in colour. Postıns made from astrakhan were called eltiri ton. The karakul sheep is a native Central Asian species, named after the village of Karakul not far from Bukhara. Bukhara has traditionally been a major centre for the production of karakul pelts. The postın is a very traditional item of clothing, more frequently worn by elderly or middle-aged men. It is well suited to the harsh Central Asian winter, especially in the exposed Aral delta. Having said this, observers like Esbergenov writing in 1980 reported that some elderly men continued to wear it in the summer! It was normally worn on top of a quilted cotton shapan and was always wrapped in the same fashion as the khalat or shapan (the left side overlapping the right, from the point of view of the wearer). It was never belted. A postın hanging up to dry in the garden of a Karakalpak home just north of Shomanay. live alongside small Turkmen communities and are close to the Turkmenistan border. A festival is only a festival for a man who has a postın." Their value is indicated by the fact that less well-off men were sometimes handed down a second-hand postın from a wealthy friend or relative. All Karakalpak postıns carry a large triangular amulet on the back just below the collar, made from the same striped silk cloth used for the decoration of the outer edges. This is similar in shape to the amulet known as a duwashıq used on the front of the roll-up shiy screen door of the yurt. However, when worn on the back of an item of clothing it is known as a jawırınsha. photographed in March 2003. The local people are Yomut Turkmen camel-breeders. Interviews conducted with elderly local Karakalpak people by ethnographers from the Khorezm Archaeological and Ethnographical Expedition in the early 1970s established that the amulet acted as a talisman to protect the wearer against the "evil eye" - the ancient and widespread folk belief that people can be harmed from the envious and malevolent stares of unfriendly people. The origins of such beliefs lie in the depths of antiquity and clearly pre-date the conversion of the Qipchaq nomads to Islam during the era of the Golden Horde. In this respect the postın is a unique item of male Karakalpak clothing - amulets were, and still are, widely used to protect women of childbearing age, babies and children (especially boys), livestock and the yurt. However they are hardly ever worn by men, with the one exception of the postın coat. Its use among the Karakalpaks has been more associated with those living in the northern part of the delta – the Qon’ırat Karakalpaks - rather than the On To'rt Urıw Karakalpaks living in the southern agricultural regions surrounding Urgench. The reasons for this difference in usage are only partly ethnic and probably also reflect the fact that the northern delta has traditionally been a livestock-breeding rather than an agricultural region and has always been neighboured by local communities of sheep-rearing Turkmen and Qazaq nomads. It also suffers from a harsher winter climate. "Among the men, the old ones – though far more seldom than they do in Uzbekistan – wear the Oriental smocks and the national round sheepskin caps. Generally the men use trousers and jackets of urban cut or short sleeveless waistcoats of dark cloth, and very often quilted jackets or military tunics." 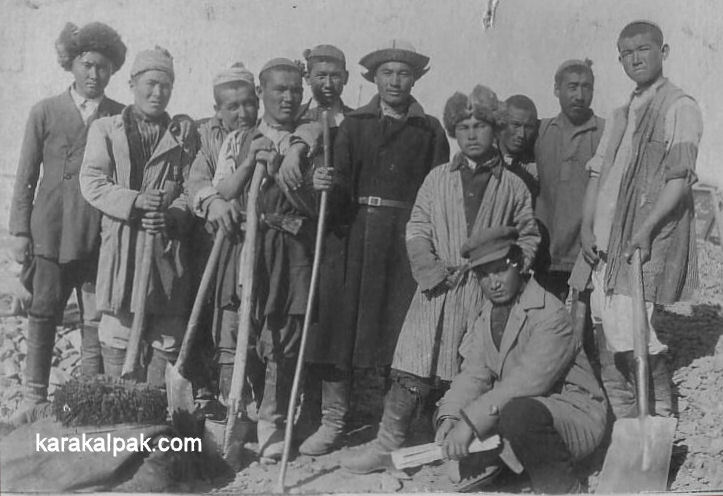 A group of Karakalpaks working on the Qızketken canal. Note that several are wearing Western-style overcoats and jackets. In 1958 Zadykhina published a study of the Uzbeks living in the Qıpshaq region of Karakalpakstan and noted that among the men: "Military field shirts and overcoats are frequently encountered." The Karakalpaks use two alternative words to describe a man's sheepskin coat - postın and ton - as do many other tribal confederations throughout Central Asia. The Karakalpak word postın is usually transliterated as postyn, pustin, or pustyn in the Russian literature. The Uzbeks of Khorezm use the closely related words postin or pustin for a sheepskin coat. The Uzbeks of Bukhara and the Kyrgyz use the term postun. The Pashtun of Afghanistan use the words postin and pushtin. However the alternative Karakalpak word ton applies to more than just sheepskin coats, being used as a more general term that can apply to any fur-lined coat. Sometimes the word ton is qualified, as in sen'sen' ton meaning a coat made from the skins of six-month-old lambs, eltiri ton meaning a coat made from the skins of two-three month-old lambs, or ishik ton meaning a coat lined with animal fur rather than sheepskin. The name ton is also used by the Qazaqs for both sheepskin and fur-lined coats, as well as by the northern and southern Kyrgyz, and the Bashkirs. According to Klavdiya Antipina, the word ton is used by the major southern Kyrgyz clan, the Adygine, and by the northern Kyrgyz. The name postun is generally used by the Kyrgyz living in the Ferghana Valley as well as those belonging to the southern Ichkilik grouping, the latter also using the word ton. The Yomut Turkmen however refer to such coats as an ichmek. They too have a special version of the coat that is worn for celebrations and festivals, known as a sikme ichmek, made from the skins of six-month-old lambs. The Tekke, however, use the word postun, while the Saryks call such coats a possun. 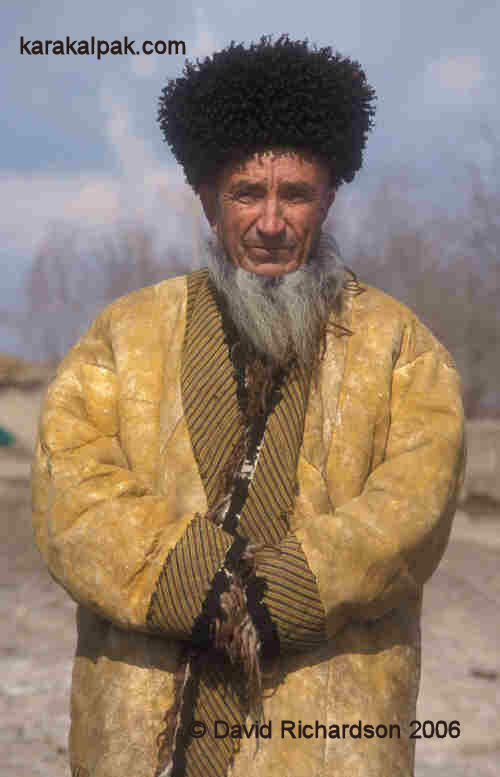 An old Turkmen Yomut gentleman, or aq saqal (white beard), wearing his ichmek. Taza Yol, north of Kunya Uaz, northern Turkmenistan, 2003. 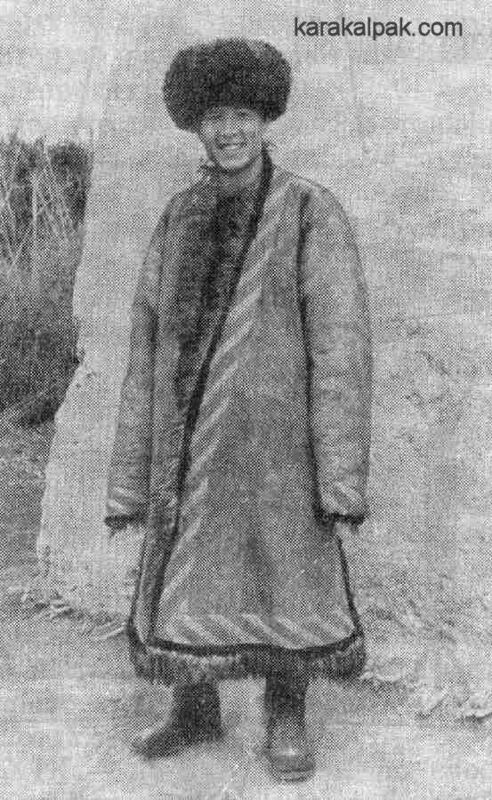 The Karakalpaks use the word ishik to refer to a silk or cotton coat with a fur lining, especially a woman's fur-lined coat, sometimes called an ishik ton. However the Karakalpak-English dictionary confusingly lists an ishik as a sheepskin jacket. The Qazaqs similarily use the word ishik for a cloth coat lined with fur, although the definition of fur can encompass the woollen fleece of a sheep. 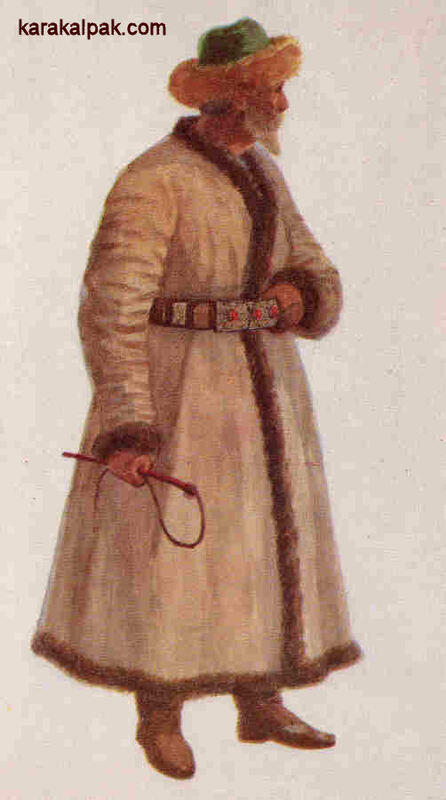 Klavdiya Antipina recorded that the southern Kyrgyz wore fur-lined coats known as ichiks, which originated from the neighbouring Uzbeks. Again the definition of fur could include sheep fleece. 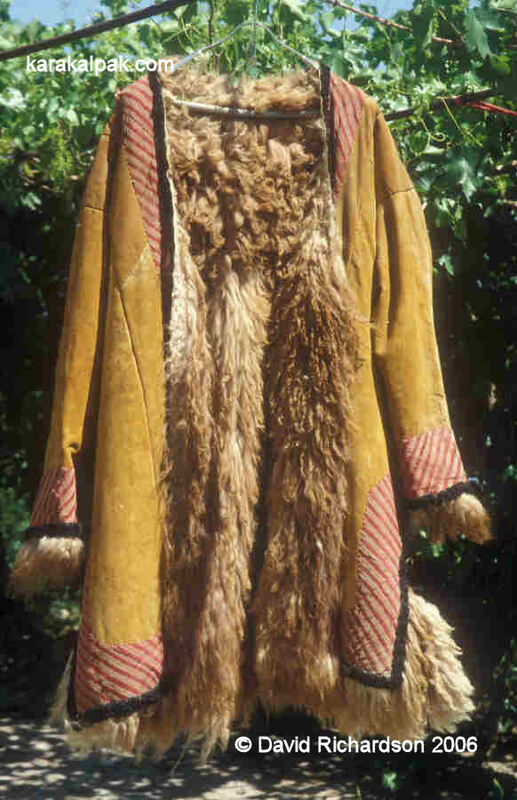 A Turkmen sheepskin coat, the equivalent of a postın, known as an ichmek or postun. 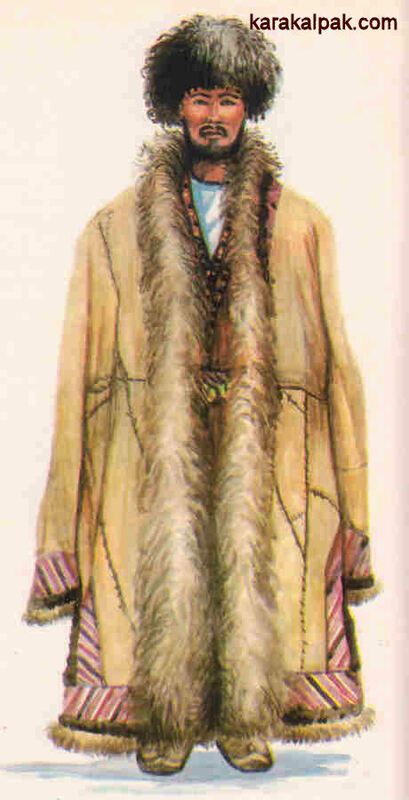 This very long coat with elongated sleeves is illustrated in A. S. Morozova's "Traditional Clothing of the Turkmen People." 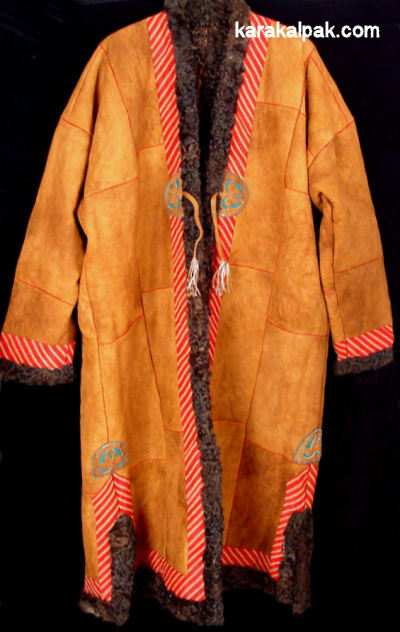 The fact that such coats are found in many different ethnic groups across Central Asia is indicative of their ancient origin. However the existence of three different basic words to describe them points towards different cultural influences. The words teri for skin and ton for fur are of Qipchaq origin and occur in the Codex Cumanicus. It seems that the word postin is of Iranian origin, the Persian word pūst meaning a skin (pūst-i barra, lambskin). Possibly ichik is of Turkic origin (Oghuz?). 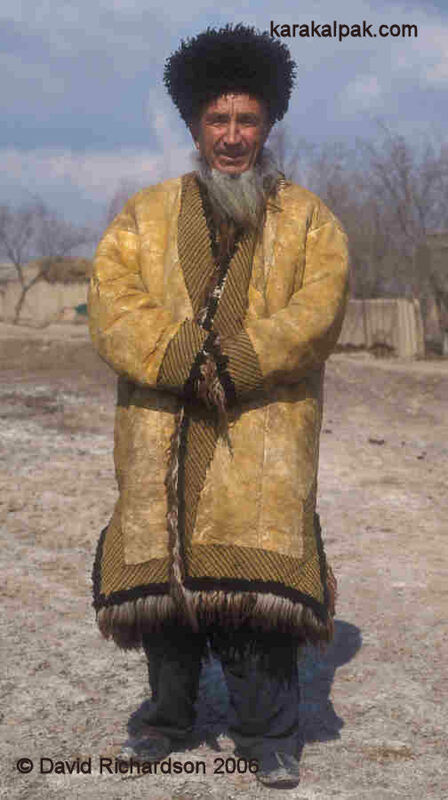 The postın overcoat is by no means unique to the Karakalpaks and is very similar to coats worn by the neighbouring Uzbeks, northern Yomut Turkmen, and Qazaqs of the Khorezm oasis. It occurs almost everywhere across Central Asia, ranging from the southern Turkmen, the eastern Qazaqs, the northern and southern Kyrgyz, and the Tajiks, an observation recorded by S. P. Rusyaykin in 1959. Beyond Central Asia it is found in Iraq, Iran, Afghanistan, Pakistan, and western Tibet. 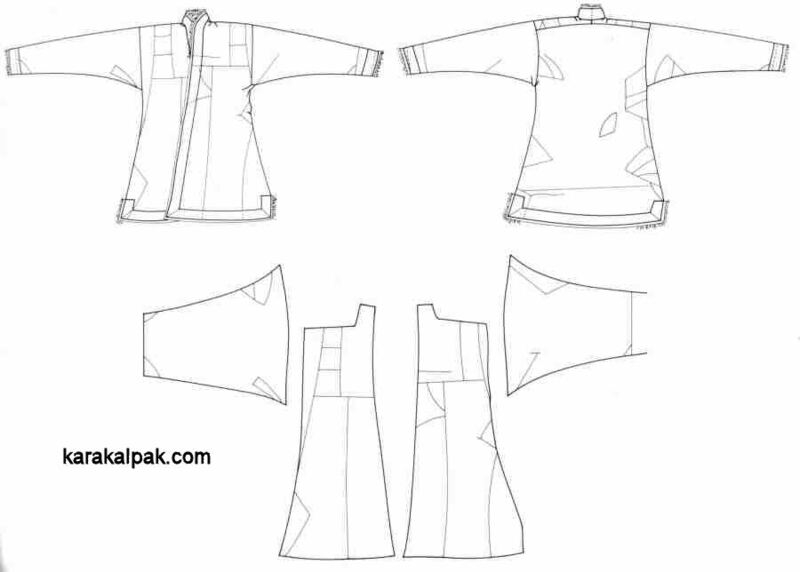 We are unaware of any Karakalpak craftsmen still making postın coats today. Most modern Karakalpak postın seem to be of Turkmen origin, imported from the Kunya Urgench region of the delta on the Turkmenistan side of the border. New postın coats can be regularly seen on sale today at the Tolkuchka Sunday Bazaar in Ashgabat. They tend to be dyed an artificially bright yellow and have prominent embroidery decoration along with a pair of leather laces for fastening the coat across the breast, neither of which are traditional. A modern Turkmen ichmek or postun from Ashgabat. 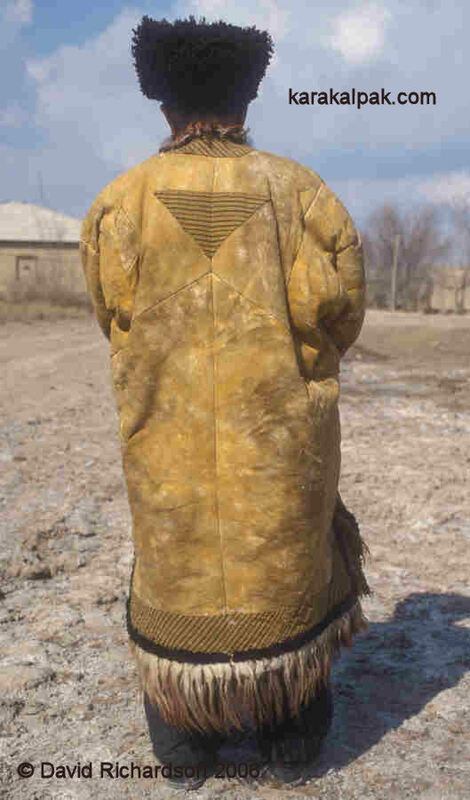 Shalekenov noted that, in the winter, elderly Qazaq men living in the lower Amu Darya wore the Karakalpak postın sheepskin coat rather than the traditional Qazaq sheepskin coat known as a ton. Illustration of the Qazaq man's ton. From "Qazaq National Costume", painted by Aysha Galimbaeva. 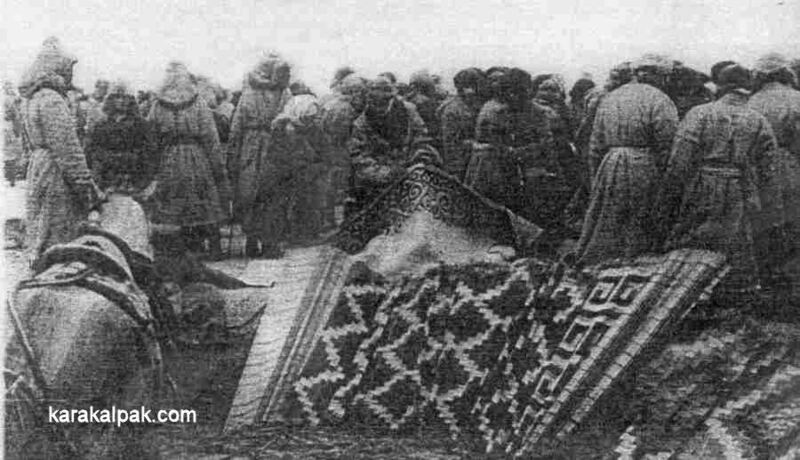 Market at Taxta Ko'pir showing men dressed in belted Qazaq overcoats, ton, and Qazaq sheepskin caps, tımaq. Photograhed by Ella Maillart in November 1933. Later as she crossed the frozen Qizil Qum from Taxta Ko'pir to Kazalinsk, she photographed three Qazaq men with their grazing camels, one of whom is standing and clearly wearing a belted and bulky sheepskin coat. The form and the cut of the postın was similar to the Qazaq ton, the main differences being that the postın was looser in fit and more greatly decorated than the ton. Postun or ton were an almost universal item of male winter clothing for the nomadic Kyrgyz, especially at the higher altitudes. Coats were even made for boys as young as three-years-old. 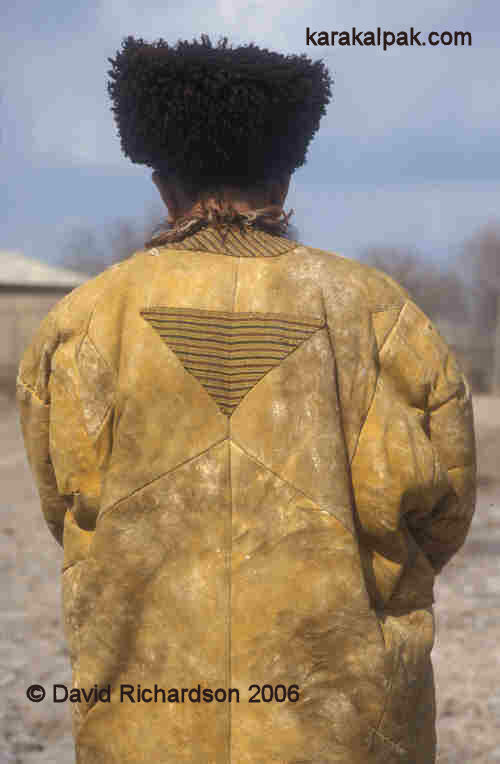 Antipina noted that Kyrgyz sheepskin coats were decorated in a similar way to those from Mongolia and the Altai, using strips of black velvet or sateen. The southern Kyrgyz from the western regions, close to present-day Uzbekistan, followed the Uzbek fashion, adding triangles of black cloth to the back, sleeves, and sides. The southern Kyrgyz also had coats made in two different colours, orange and white, some village communities preferring orange, others white. During the mid-20th century a new type of postun emerged among the Kyrgyz featuring prominent sheepskin lapels. In Afghanistan, too, postins were worn by men of all classes during the winter season. According to Dr Henry Bellew, the manufacture of postins was a major industry in many towns and cities during the 19th century, including Kandahar, Ghazni, and Kabul. Postins made in Kabul were considered to be the best and many were exported to Peshawar and beyond. Many of those made in Khandahar were exported to Pakistan. Demand was particularily strong in 1857, since the Afghan postin had recently been adopted as the regulation winter dress of the Punjab army. Postıns were traditionally made by master craftsmen, known as tonshı by the Karakalpaks and as postindoza or postinchi by the Khorezmian Uzbeks. The main workshops were located in the major cities or larger settlements, Khiva being the most significant centre of production in the Khorezm region. Here sheepskin and astrakhan pelts were processed for use in the manufacture of coats and caps, some pelts even being exported to Bukhara to be made into coats by Bukharan masters. Postıns were usually sewn to order. According to Zadykhina and Sazonova, one coat made of astrakhan lamb required eight or nine pelts taken from two- to three-month-old lambs. After thorough cleaning the skins were coloured a light yellow or yellowish grey colour using a natural dye made from pomegranate skins steeped in a solution of salt. The dye was known as anarpost in Karakalpak, anar being the word for pomegranate. 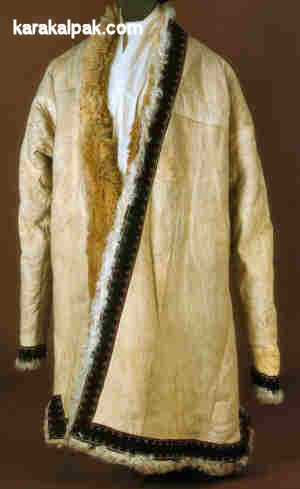 The cut of the sheepskin coat was similar to that of the khalat or shapan and was prescribed by long-established rules. No significant deviation in the size of the postın was permitted - only the length of the coats could be varied. For making measurements the postindoza used the span of a man’s hand from the little finger to the thumb, this length being known as a taxta. For smaller measurements they used four finger widths. Illustration of the structure of a Karakalpak postın. From Tatiana Zhdanko's "Karakalpak National Costume", 1952, where it is described as a ton. The postın sheepskin coat was tailored in a similar manner to the quilted shapan. The treated pelts were sewn into longitudinal strips, which were then joined side by side. A thin strip of yellow sheepskin leather was inserted into the seams joining the strips for extra strength. The sleeves were made from transverse strips of sheepskin pelt, but in this case they did not place leather inserts within the seams. The collar was normally made from darker hide, standing up at the rear and folding down into small lapels at the front. The bottom part of the side seams were tailored with small slits for increased comfort. The edges of the collar, the cuffs, the front opening, and the bottom hem of the coat were usually finished with strips of black astrakhan or karakul, while the outer borders were decorated with bands of striped silk cloth, cut on the bias so that the stripes were oriented diagonally. Karakalpak masters used red and black striped jipek, somewhat similar to Khorezmian alasha, while Turkmen masters used various types of silk keteni. A triangle of the same material was sewn onto the back of the coat to provide amuletic protection for the owner. Further decoration was sometimes added to the front panels at the bottom of the collar, in the form of small embroidered red velvet triangles. The slits on the hem were also sometimes decorated with embroidery. Illustration of the structure of a Khorezmian Uzbek postin. From Zadykhina and Sazonova's 1979 review of Khorezm Uzbek male costume. Nina Zadykhina and Mariya Sazonova report a comment recorded by V. Yu. Krupyanskaya from a master postindoza, whose father, grandfather, and great-grandfather had also been postindozami. He said that 40 years earlier, in other words at some time between 1880 and 1890, postindoza used embroidered cloth to make the triangular amulets rather than striped silk. Details of the Turkmen ichmek from Northern Turkmenistan. Dr Henry Bellew, a medical oficer in the British Army, left us a detailed account of how postins were manufactured in Afghanistan in the middle of the 19th century. Sheepskins from the butcher were first cured by curriers, who first washed, cleaned, combed, and stretched them on boards before treating the inner surface with a thin moist paste made from equal quantities of wheat and rice flour and a little salt. This treatment was repeated every 24 hours over a period of four to five days, the skins being left to dry in the sun in between. The paste was removed, the skins washed and dried, and the loose tissue and fat adhering to the skin removed with an iron scraper. Now the skin could be put on a stretcher for tanning. The tanning mixture used in Khandahar consisted of 18 pounds of finely powdered dried pomegranate rinds, 4 pounds of powdered alum, and ½ pound of powdered red ochre, all mixed together in half a gallon of sesame oil to make a thick paste. This quantity was sufficient to dye 100 pelts. The skins were slightly moistened before being rubbed by hand for several minutes with the tanning paste. After being left to dry for a period of between one and three days the paste was removed and the skins were rendered soft and supple by crumpling them by hand and beating them with thin twigs. The skins were now transferred to the tailor, who cut them into strips 2 feet long by 4 to 5 inches wide. These were then assembled into three different types of garment: postincha, postaki and postins. Postincha were small coats with short sleeves that required 2 or 3 sheepskins to make; postaki were fully sleeved coats that reached down to the knees and required 5 or 6 sheepskins; while a proper postin was a capacious coat that reached down to the heels and had sleeves extending beyond the tips of the fingers. Its manufacture required 10 to 12 sheepskins. After sewing, the edges and sleeves of these coats were richly embroidered with yellow silk by female embroiderers. In the western parts of Afghanistan it was traditional to have white rather than yellow postins. In these regions the pelts were dyed with a mixture incorporating white clay. "G drove me to a street mainly inhabited by dealers in sheepskin. On entering one of the shops, we were nearly compelled to beat a retreat, owing to the smell. ... The sheepskins were in every stage of preparation. The heat thrown out by a heavy drying-stove was very great, and only the absolute necessity of ordering some warm clothes forced me to remain for an instant in the establishment." He went on to add that sheepskin garments were the warmest clothes that can be worn, despite their disagreeable smell. The only Karakalpak postın on public display in No'kis was at the former Regional Studies Museum. Unfortunately this museum was closed and the building housing it was demolished in 2010. It is hoped that it will reopen in a new city centre location in 2012. A Karakalpak postın, described as a sen'sen' ton. 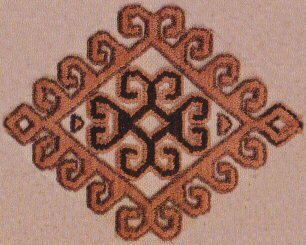 The silk keteni edging indicates that it is of Turkmen origin. According to Esbergenov, one of the earliest examples of a Karakalpak postın was collected by S. P. Tolstov in 1934 for the Folk Museum of the USSR. It was subsequently transferred to the State Museum of Ethnography of the USSR, Moscow. This example was brown in colour and decorated with striped silk material. It had a straight cut and the sleeves were tapered from the shoulder to the cuff. It was 115cm long and had a sleeve length of 66cm. It was made from several sheepskin pelts. Some 40 years later, between 1971 and 1975, the Khorezm Archaeological and Ethnographical Expedition located several postıns and photographed and measured them. One example was reported by Esbergenov as being dyed an ochre colour and was 117cm long, had a sleeve length of 54cm and a side seam vent of 21cm. The width of the outer red striped silk decoration along the edges of the coat was 8cm, except on the cuffs where it was 11½cm. The coat had a triangle with 29cm long sides sewn to the back. According to the maker the postın was sewn from six to eight sheep's pelts. A simple Uzbek postin from the reserve collection of Khiva Museum, 2003. Note the absence of any textile decoration around the coat edges. Photograph courtesy of Botir Davletov, Ichan qala Museum Director, Khiva. In addition, there are two Bukharan Uzbek postins in the Ole Olufsen Collection at the Danish National Museum in Copenhagen. 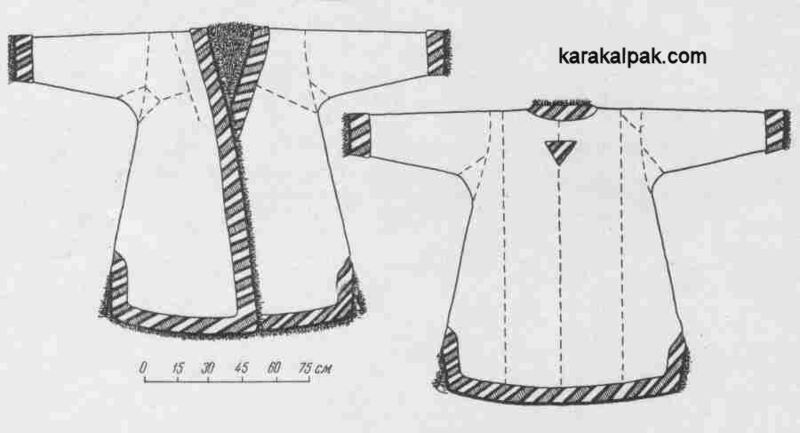 The origin of the Karakalpak postın and the other similar coats found across Central Asia substantially predates the formation of the Karakalpak, Uzbek, and Qazaq confederations. Sheepskin coats in general have been in use for several millennia across Central Asia. Indeed, given the evidence that the domestication of sheep probably first took place in relatively nearby northern Iraq around about 9,000 BC, it is likely that sheepskin pelts have been used to make coats and other items of costume in Western Asia since the early Neolithic and probably the Mesolithic era. One of the earliest surviving fur-lined coats was found at the ancient burial site of Qizilchoqa (Red Hillock), discovered in 1978 close to the Silk Road town of Hami, in the southern foothills of the Tien Shan in the Xinjiang Uighur Autonomous Region of western China. The cemetery has been subsequently radiocarbon dated to about 800 to 530 BC. Among the many woollen textiles excavated from the site was a fur coat, made with the fur turned inwards, and surprisingly incorporating an integral pair of gloves. 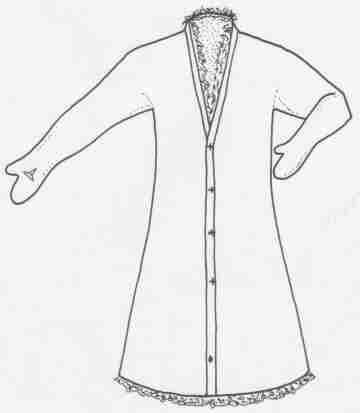 Drawing of the gloved, fur-lined coat excavated at Qizilchoqa. From Mallory and Mair, 2000. In the early 1990s the mummified body of a man, estimated to have been at least 55-years-old, was found next to the corpse of a woman in a shallow grave at the nearby site of Subashi. This later site dates from about the 4th to the 3rd century BC. The man was wearing a heavy sheepskin coat, worn with the fleece turned inside. Another grave contained the corpse of a woman wearing a calf-length sheepskin coat with sleeves, also made with the fleece facing inwards. The coat was placed over her shoulders like a cloak. She also wore a tall black felt hat with a wide brim. 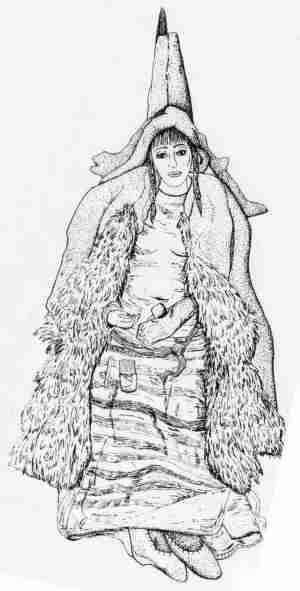 Drawing of one of the "Subashi Witches" wearing a bulky sheepskin overcoat. 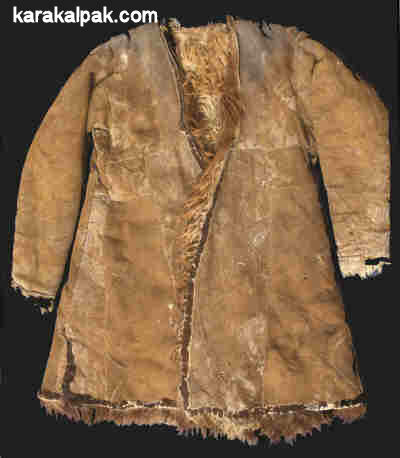 Although clothing specifically made from sheepskin was not identified in finds from the the more westerly kurgan burials at Pazyryk, in the Siberian Altai, similarly dated to the 4th to 3rd century BC, other items of costume excavated from the site show that the tailoring of fur pelts and skins had already reached a sophisticated level. Many items of clothing were fur-lined. Likewise the contemporary Scythian warriors depicted on the gold and electrum vessels excavated from kurgan burials in the Ukraine are shown wearing finely tailored leather jerkins, beautifully decorated with braid and fur edgings. "The inhabitants of our host country kindly invited us to take our precautions with regard to clothing and advised us to carry a great quantity of it. During one frightening day they went over our venture and demonstrated the dangers to us. When we saw the reality through our own eyes we realised that it was twice as great as we had previously been told. Each one of us wore a tunic over a caftan, a fur-lined coat of sheepskin over a cardigan of felt and a bonnet which revealed only two eyes. Each one of us also had simple trousers and another thicker pair, slippers, boots of chagrin leather and over the boots some more boots, so that each one of us, when placed on top of the camel, could not move because of all this clothing." According to the Hudûd al-Âlam, compiled towards the end of the 10th century, the Kerder region of Khorezm (the Aral delta) was a major producer of sheepskins at that time. William of Rubruck's embassy was equipped with "rough sheepskin coats" for the four-month winter journey from Batu's camp on the Volga to Möngke's court in Mongolia in late 1253. They were also issued with fur hoods, sheepskin trousers, and felt boots and leggings. The first description of Karakalpak costume was recorded by Ivan Muravin in 1740 after visting their encampment on the Quwan Darya. He observed that Karakalpak men wore the same costume as the Qazaqs of the Lesser Horde, the main difference being that the Karakalpaks did not have red leather belts. The Qazaq costume consisted of a shapeless jeyde shirt and a chapan, over which was worn a khalat or a fur coat. Whether the definition of a fur coat encompassed sheepskin we do not know, although Muravin did note that the Qazaqs kept sheep. In 1772 Johann Georgi described the importance of lambskins to the Qazaq nomad economy. Qazaq lambskins were highly valued, being rated only second in desirablity to Bukharan pelts. They could be white, black, blueish grey, spotted, or fox-coloured and were graded by quality, the best having a wavy appearance like damask cloth. The Qazaqs even sewed linen cloth around the new-born lambs to protect their coat and to encourage the growth of a wavy fleece. "The sky was remarkably pure and brilliant. The air piercingly cold. I drew closer my posteen, or cloak of fur." Abbott recorded that postins were made from dhoomba's skins and made with the fur inside. The leather was tanned to the consistencey of wash leather (chamois), stained a buff colour and beautifully embroidered with floss silk. Their price was about 8 ducats or £4 each, a considerable sum of money at the time. This must have been a good quality coat, although Abbott commented that wealthy men wore coats of cloth lined with Siberian furs. At roughly the same time Nikolay Khanykov was in Bukhara where he discovered that lambskin postins, or pustins as he termed them, were one of the main items of export from the region. Bukharan postins were especially popular throughout Persia. Obviously the price of a postin was seasonal, the price falling in the springtime. Consequently of the four caravans travelling from Meshed to Bukhara annually, the spring caravan was the largest, Persian merchants taking the opportunity to purchase Bukharan postins at bargain prices. Khanykov quoted the market price for a grey Arab postin at 4½ tillas, and that for a black Arab postin at 3 tillas. At that time a golden tilla was valued at 14 roubles 35 kopeks, equivalent to about 4½ US dollars or £1 sterling. This suggests that prices in Bukhara were similar to those in Herat. In today's prices this would be of the order of $100. "Dreading, too, the cold we had been warned of, I enquired for a sheepskin shub, but could not find one to my taste in the bazaar, so poor was the choice." The postin collected in Osh by Ole Olufsen's Expedition in 1897. It has been decorated with a black outer edging of embroidered silk velvet. Drawing of Olufsen's postin, numbered 216, showing the arrangement of pelt fragments. Olufsen described this as a Sart's sheepskin coat or chalat, made from the large wild Pamir sheep (Ovis poli). At that time the word Sart was applied to all settled villagers throughout Turkestan, so the coat is likely to be Uzbek. Olufsen's second coat, inventory number 9, was purchased in 1896 from the Kyrgyz of the Altai Steppe in the Northern Pamirs. It is decorated on the outside with strips of plain blue velvet. Formally described as a chalat, Olufsen referred to it as a postun in his notes, adding that the Pamir wild sheep was greatly valued for such coats in view of its long thick fleece. However because these were difficult to obtain at that time, most people had to live with coats made from ordinary sheepskin. Interestingly Olufsen must have been impressed by the qualities of the local postins, since he purchased a third for his own winter costume for exploring the Pamirs. As elsewhere in Central Asia the Karakalpak postın remained in widespread use throughout the early part of the 20th century. However the increasing availability of inexpensive military-style woollen overcoats from Russia gradually eroded the postıns popularity. Karakalpak young man wearing a postın in the late 1950s. Even so it continued to be worn after the Great Patriotic War and can still be seen today in some of the remoter parts of the delta. 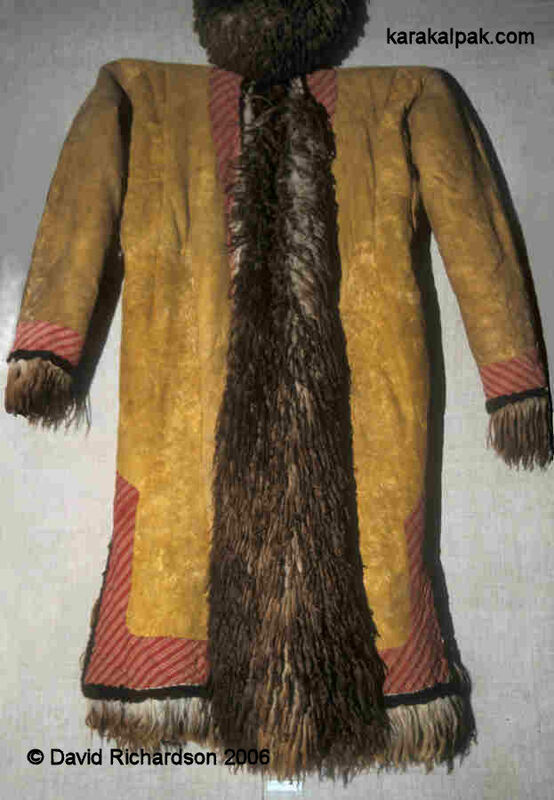 In the past, Karakalpak men wore two different types of pelt coat – the tayshaxı and the qılqa. We have never seen an example of either. The tayshaxı was apparently a simple, undecorated knee-length coat made from a tayınshaq, the tanned pelt of a foal. It was worn hair side out and was the traditional winter dress of shepherds and livestock farmers. Frost will force a man to wear a tayshaxı." It implies that the tayshaxı was the dress of the poor people who could only afford to live on millet. It is also mentioned in certain historical folk legends. One tells of how in the late 18th century, the Khan of Khiva, Muhammad Amin, persuaded Aydos bay, the leader of the Karakalpak Qon'ırat tribe, to murder his brothers in return for leadership over all of the Karakalpak tribes. In reality, Aydos actually killed his brothers and allied himself with Khiva against the rebel Karakalpaks. In the legend however, Aydos presented his brothers heads to the devious Khan, who replied: "You are a Karakalpak. Put on your tayshaxı and become a shepherd. Now that you have killed your brothers you can never become the ruler of the Karakalpak people." A similar unlined coat for shepherds was made by the Qazaqs from the pelt of a one-year-old foal, worn hair side out. It was called a tayjakue. Specialists on Qazaq national costume believe that there was a widespread tradition of producing a range of winter clothes from animal pelts. The Kalmuks from the Volga river region along with the Bashkirs and the Altais used the same technique for producing men’s winter coats. The qılqa was another everyday knee-length winter coat, worn in the past by shepherds, livestock farmers, and cereal croppers. It was made from tanned sheep’s pelts and was worn fleece side in. Another Karakalpak legend tells how the qılqa first appeared among the Karakalpaks. The Prophet Muhammad bequeathed his qılqa to Xoja Ahmed Yassawi, who was to be born some 500 years later, long after the Prophet’s death in 632. Sultan Uvays Karanee, one of the Prophet’s followers, was entrusted to pass the holy qılqa over. Sultan Uvays Karanee lived until Xoja Ahmed Yassawi was born and then gave him the qılqa. Afterwards, according to the legend, Sultan Uvays continued to live in Khorezm and was buried in the Sultan Uvays Dag Mountains, named in his honour. He subsequently became a saint and today his burial place remains a revered and holy place that is regularly visited by many Karakalpaks. Abdullaev, T. A., and Khasanova, S. A., Uzbek Costume (19th to early 20th century) [in Russian], Published by Fan, Tashkent, 1978. Abbott, J, Narrative of a Journey from Heraut to Khiva, Moscow and Saint Petersburg, William H Allen and Co., London, 1843. Anon, Hudûd al-Âlam, translated by V. Minorsky, Gibb Memorial Trust, Oxford University Press, London, 1970. Bellew, H. W., Journal of a Political Mission to Afghanistan in 1857, Smith, Elder and Co., London, 1862. Burnaby, F G, A Ride to Khiva, Oxford University Press, Oxford, 1997. Dzhabbarov, I. M., Crafts of the Uzbeks of southern Khorezm at the end of the 19th - beginning of the 20th century [in Russian], Transactions of the Institute of Ethnography of the Academy of Sciences of the USSR, Volume 97, pages 110 to 111, 1972. Fihl, E., Exploring Central Asia, Rhodos, Copenhagen, 2002. Gladyshev, D. V., and Muravin, I., Journey from Orsk to Khiva and back, completed in 1740-1741 by Lietenant Gladyshev and Geodesist Muravin, Geographical Proceedings, Published by the Russian Geographic Society, Issue 4, Saint Petersburg, 1850; Second Publication, 1851. Khanykov, N., Bokhara, its Amir and its People, James Madden, London, 1845. Maillart, E. K., Turkestan Solo, translated by John Rodker, G P Putnam’s Sons, New York, 1935. Mallory, J. P., and Mair, V. H., The Tarim Mummies, Thames and Hudson, London, 2000. Morozova, A S, Traditional Clothing of the Turkmen People [in Russian], Traditional Clothing of the Peoples of Central Asia and Kazakhstan, edited by Lobacheva and Sazonova, pages 39 to 89, "Science", Moscow, 1989. Qosbergenov, R., Culture and Life of the Karakalpak People in the Colonial Period (1873 - 1917) [in Karakalpak], Published by "Karakalpakstan", No'kis, 1970. 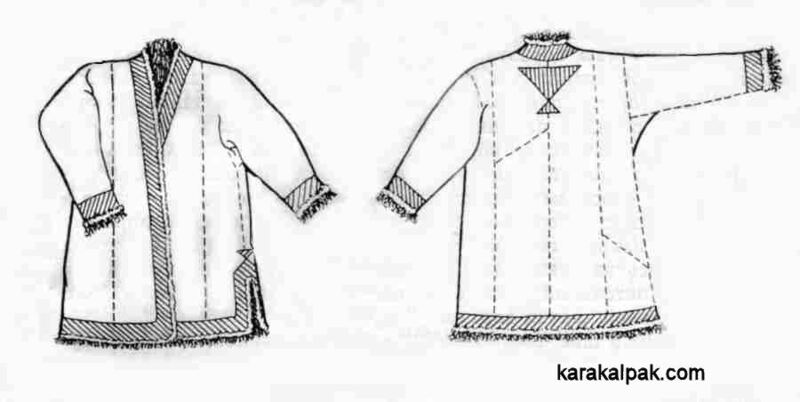 Rusyaykina S. P., The People's Clothing of the Tajiks of Garm region [in Russian], Central Asian Ethnographical Collection, page 165, Publishing House of the Academy of Sciences of the USSR, Moscow, 1959. Shakanov, T., Editor, Qazaq National Costume, Publisher Zhalyn, Alma Ata, 1976. Wood, H., The Shores of Lake Aral, Smith, Elder, & Co., London, 1876. Zadykhina, K. L., and Sazonova, M. V., Men’s clothing of the Uzbeks of Khorezm at the end of the 19th – beginning of the 20th century [in Russian], Costumes of the Peoples of Central Asia, pages 151 to 169, edited by O. A. Sukhareva, Nauka, Moscow, 1979. Zadykhina, K. L., Culture and way of life of the Uzbeks of the Kipchak region of the Karakalpak ASSR [in Russian], Archaeological and Ethnographic Works of the Khorezm Expedition, 1949 - 1953, Volume 2, pages 761 to 808, Academy of Science of the USSR, Moscow, 1958. Zhdanko, T. A., Everyday Life in a Karakalpak Kolkhoz Aul, excerpts given in document number 28 in "Changing Attitudes in Soviet Russia: The Nationalities Problem and Soviet Administration: Selected Readings on the Development of Soviet Nationalities Policies", by W. W. Gottlieb and R. Schlesinger, Routledge and Kegan Paul, London, 1956. This page was first published on 11 March 2007. It was last updated on 8 February 2012.